I love short stories. I really do. I’m continuously impressed by how much plot and emotion can be packed into such a small number of pages, and to me it really speaks to the skill of an author. 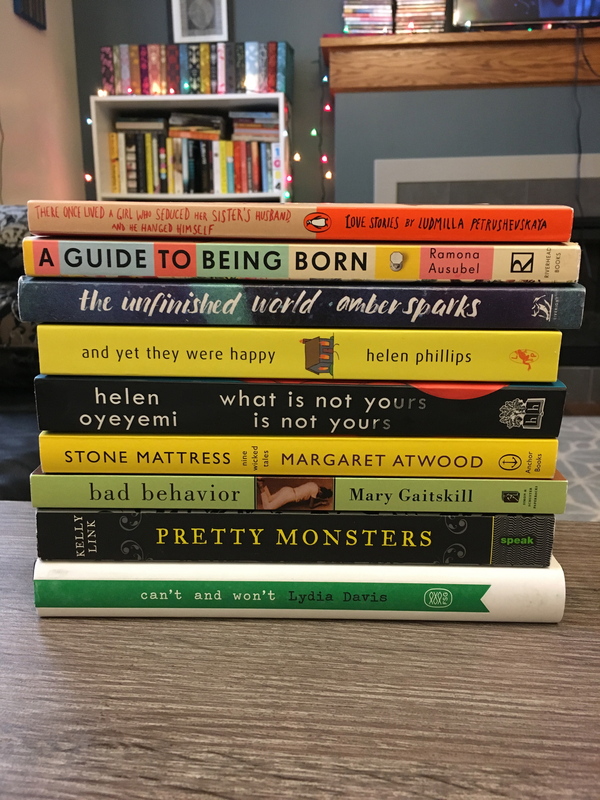 I’ve recently started to recognize my love of short story collections and have been attempting to pick up more of them (and buy A LOT more of them), but when I gathered all of the short story collections I’ve read together on a Goodreads shelf, I was really not impressed by the number. It inspired me to want to pick up short story collections more often, and to set a solid reading goal for myself (as I laugh at myself for thinking I can actually stick to a reading goal) (No, but for real this time, I actually want to stick to this one) : to read one short story collection per month in 2017. I already missed January, but that’s OK. This month I’m currently reading Kissing the Witch by Emma Donoghue, which is a collection of feminist fairytale retellings (is there anything more in my wheelhouse than that phrase? ), but I need to keep this going strong throughout the year. Short story collections are great because you don’t necessarily have to read straight through them; you can read one or two stories per day and get through one in a week or so that way. Because of that, I feel like one short story collection per month is actually a pretty attainable goal, and I’m going to hold myself accountable this time. As you can see, there are a lot of repeat authors here: the vast majority of short story collections I’ve read have been from Jhumpa Lahiri, Neil Gaiman, and Kelly Link. Because they are awesome. But this also does point to the fact that I really need to branch out to new authors in my short story reading. Amelia Gray’s Gutshot was one of my favorite books of 2016, and it was a total gamble on a new-to-me author who I ended up loving, going to see speak, and buying another book from. Carmen Lau’s The Girl Wakes was my absolute favorite read of 2016 and I found it at a local small press book fair. Branching out in reading always pays off. My short story TBR list contains a lot of books that I already have on my physical TBR shelf, so this works well with the #readmyownbooks challenge. A lot of my picks are well-within my wheelhouse: female authors, magical realism, weird fiction. I have all four of these on my physical TBR shelf (yes, I have two unread Kelly Link short story collections on my TBR shelf. Oops.) and I keep meaning to pick all of them up and then not doing it. I actually did start Pretty Monsters at one point, but after the first story I never returned to it, and I felt like it was just sitting on my bedside table judging me, so I put it back on the shelf. As far as Stone Mattress goes, Margaret Atwood is one of my absolute favorite authors and I have no excuse whatsoever for not reading it yet. I’ve only read one book by Helen Oyeyemi (Boy, Snow, Bird, which I really enjoyed) and I have FOUR unread books of hers on my physical TBR shelf, one of which is a short story collection–What is Not Yours is Not Yours. I’m planning on saving White is for Witching for an October read, but I really have no excuse for not yet picking up the other ones. Short story collections from new-to-me authors: The Other World, it Whispers by Stephanie Victoire, The Unfinished World by Amber Sparks, By Light We Knew Our Names by Anne Valente, and A Guide to Being Born by Ramona Ausubel. I own physical copies of all of these except By Light We Knew Our Names. Apparently short story collections get the most beautiful covers in the world. I can’t even with these lovely rainbow situations. And here are a bunch more! There Once Lived a Girl Who Seduced Her Sister’s Husband and He Hanged Himself by Ludmilla Petrushevskaya (what an amazing title, btw), Bad Behavior by Mary Gaitskill, Can’t and Won’t by Lydia Davis, North American Lake Monsters by Nathan Ballingrud, The Color Master by Aimee Bender, The Last Animal by Abby Geni, Unclean Jobs for Women and Girls by Alissa Nutting, and And Yet They Were Happy by Helen Phillips. I would love to hear everyone’s thoughts on this–what are some of your favorite short story collections? Have you read any of these? Do you ever set goals for yourself for reading short stories? Let me know!